Onsen yado/At a hot spring, 1920.7, gauffrage, sealed Goyo, suri (printer) Hirai Koichi, and Hashiguchi, 46.3 x 28cm. Futokoro kagami/Pocket mirror, 1920.9, sealed Goyo, with printer and Hashiguchi seals as the first, 46.3 x 29.8cm. 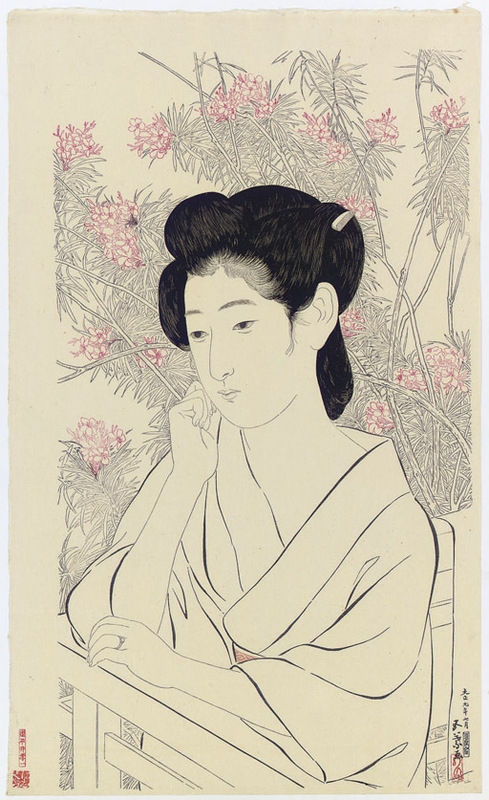 Hotaru kago moteru onna/Woman with a firefly cage, 1920.7, sealed Goyo, printer and Hashiguchi seals as the first, sealed on verso Goyo hanga kenkyujo no in [artist's association], toku ["special"], numbered 8/150, 45.4 x 28.8cm.